mwe3: Can you tell us where youre from originally, where you live now and what you like best about it and how does it influence your music? that and the trees. I can't really say that where I live has any real influence on my music, though I have definitely been inspired by the people I've met here. mwe3: What were your early musical studies like and what instruments did you study early on? At what point did you decide to become a recording musician and how do you stay in shape as a musician as far as practicing and improving the way you write and compose? MIKE BROWN: My dad bought me an old acoustic guitar when I was in the 4th grade. I learned a few Beatles tunes, but I soon grew frustrated and gave up on it. I was in the 9th grade when I picked it up again. I took guitar lessons over the next few years, and took a piano course at the local community college. I planned to major in music, but switched to a business major after about a week. I didn't like the structure of music school, and decided it was taking all the fun out of playing for me. I found I preferred learning by ear and playing whatever I wanted, whenever I wanted. Eventually I bought a 4-track cassette recorder, and spent a few years experimenting, writing and recording prior to forming The Ravelers. My initial goal with The Ravelers was to be able to record my songs with a real band in a real studio. It was always the writing and recording process that interested me most. As for practice, I really don't do much of it these days. I just sit on the couch and watch TV and noodle on the guitar until I stumble across something interesting. After that, I just play the parts until I can record them properly, then I move onto the next tune. Since I don't perform live these days, I rarely play tunes again once they've been recorded. I move onto the next thing. mwe3: What musicians influenced you early on? It sounds like you were greatly influenced by both the instrumental guitar greats, the prog-rock legends as well as film music icons like Ennio Morricone for example. Would you say thats a fair assessment? it was all over the place. That's where I heard the first rock instrumentals that really made an impression on me: "Frankenstein" by Edgar Winter, "Outa Space" by Billy Preston and "Hocus Pocus" by Focus. Those all came out around the same time, and I just loved them. A friend had an 8-track with Hocus Pocus on it, and we used to listen to it over and over again. We'd jump around like fools! This was all before I even thought about playing guitar. mwe3: When did you start The Man From RavCon and how did you come up with the name? Was it an evolution of your work in the band The Ravelers? How would you compare your work in the Ravelers with The Man From RavCon? MIKE BROWN: In the late 2000's, after The Ravelers had ended, I decided to start on some new recordings. In order to share these tracks, I wanted to create a myspace account. I had to pick a name for the account, and didn't want to use Mike Brown. There are quite a few of us, you know? 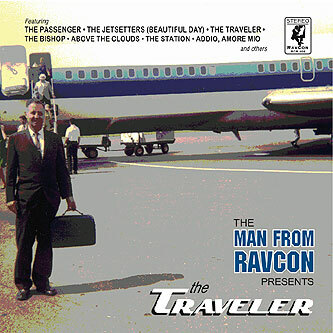 Anyway, a few years earlier, my friend Mike Bozart had come up with the tongue-in-cheek concept of RavCon - an acronym for Ravelers Consortium. RavCon included all the folks within The Ravelers' "organization". He actually had bumper stickers printed! It was pretty funny, but you probably had to be there. Anyway, I had to pick a name to register the myspace page, so on the spur of the moment, I decided to use The Man From RavCon. I'm sure my contributions to The Ravelers show through in The Man From RavCon stuff occasionally, but it's really only a connection in name. The Ravelers became a shared vision, whereas TMFR is all me. 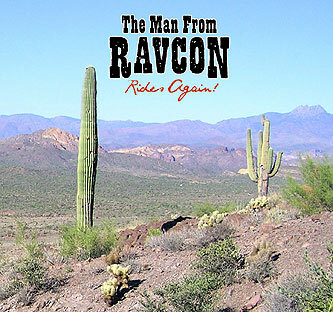 mwe3: How many albums have you released as The Man From RavCon and what was your musical mission, so to speak with The Man From RavCon and how has that mission changed or improved over time? MIKE BROWN: Skyscraper is my sixth MFR release. When I started this project back in the late 2000's, I didn't really have a mission. I was in the midst of a huge DVD collecting phase and didn't really listen to pop music at all. All of these cool films were being made available affordably for the first time, and I was exposed to some fantastic music as a result. I began writing and recording stuff influenced by the most interesting work I was discovering - scores for 1960s/'70s/and '80s cult cinema - spaghetti western, blaxploitation, spy and horror films... There's really so much great music there to be mined. I found it totally refreshing and inspiring. I really appreciated the instrumental aspect. Vocal music tells you what to think, instrumental music lets you create your own story. My first album, Zombie Pimp Cowboys From Outer Space, was basically a collection of early experimental tunes emulating these influences. It got such a positive response, I figured I was onto something! Over time, I've added elements from other areas of interest, including surf rock and prog. If anything has improved, I would hope it would be that these elements have melded into a more organic and cohesive sound, with each tune incorporating several influences rather than just one particular style. That's not to say that I won't consider genre specific releases in the future though, I've currently got a Blaxploitation project that needs completing! mwe3: The new Man From RavCon album is called Skyscraper. 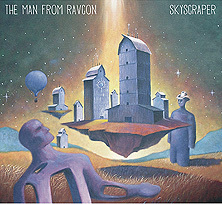 Why do you call it Skyscraper and how is the new album an extension of your earlier Man From RavCon albums? Where and when was the music written, produced and recorded? MIKE BROWN: I don't come up with album titles until I've completed all the tracks for each album. On this one, when I listened back after everything was completed, I just had this image of a lofty, towering construction. Skyscraper, the title for the most lofty, towering tune on the album, just seemed to fit. I think of Skyscraper as a kind of mellower, more contemplative sibling to my previous release, The Traveler. For these two albums, I didn't set out with a plan for what they would sound like, or what type of influence I would favor. 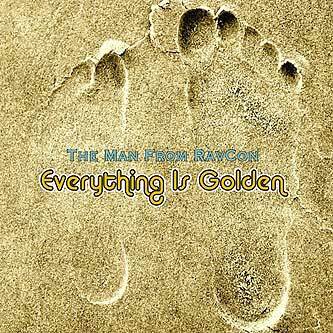 For example, on my second album, Everything Is Golden, I went for a surfy feel. My third album, Rides Again, was a Spaghetti Western project, and my fourth album, Night Of The Beast was my version of a horror soundtrack. These albums had specific influences and themes. With Skyscraper and The Traveler, I just went with the flow and recorded what came naturally, without a pre-designated theme. Luckily, when all was said and done, the tracks worked together as a whole. Skyscraper was written and recorded during the first half of 2013. As with all my other Man From RavCon releases, it was recorded in my home studio here in Charlotte. mwe3: What guitars and other gear are you featuring on the Skyscraper CD and would you say your use of the mellotron separates The Man From RavCon from other instrumental bands as well as other artists in general, especially from the rock fusion and soundtrack artists recording today? What is your experience with the Tron and do you use an actual tron or the popular digital samples and who is your favorite mellotron player and what are your favorite mellotron sounds? MIKE BROWN: My main electric guitars for Skyscraper were my Fender Jaguar, Douglas Gravity (thinline Tele clone w/p90 pickups), Danelectro Baritone, Agile 12-string, and SX Bass. For acoustics, I used my Taylor and my La Patrie classical guitar. I always mic the acoustics and record the electrics direct using Fender Amplitube software. Aside from guitar, I think my favorite sounds ever come from the mellotron. I don't use it to set myself apart, I just love it's sounds - especially the string, choir and flutes. They're all so organic and there's so much texture there with the imperfections in the tapes. I've always admired the way Robert Fripp used mellotron with King Crimson, as well as Tony Banks of Genesis, but I guess the godfather of the Tron would have to be Mike Pinder of The Moody Blues. He really had it mastered. When The Ravelers were recording at Sea-Saint in New Orleans, we tried to use their mellotron, but couldn't get it to work. I was so disappointed! I don't own a mellotron, but thanks to the magic of the digital age, I'm able to get all those classic sounds using M-Tron Pro software. These sounds, as well as other samples and synths, were controlled using my Ensoniq SQ 1+ and Casio Privia keyboards. All tracks were recorded and mixed on my iMac using using Garageband software. MIKE BROWN; I'm not a drummer, but I know exactly how I want the drums to sound on my tracks. In order to keep this in house, and to expedite the creative process, I use Toontrack's EZDrummer software. I've used it on all my albums except Zombie Pimp Cowboys, on which I used a Boss drum machine and drums sequenced on the Ensoniq. EZDrummer was a giant leap forward for me. It's easier to use than a drum machine, and gives me a much more realistic and natural sound. I either create drum tracks from scratch, or manipulate existing MIDI tracks to fit my tunes. It's a very time consuming and quite tedious task, but it's actually one of my favorite parts of the process. I think I covered all the other instruments used in the previous question, and yes, there was LOTS of overdubbing! mwe3: Balloon is a great way to start off the Skyscraper CD. What inspired Balloon and do you feel the track is a great way to achieve lift-off for the CD so to speak? How do you determine what track will feature a more guitar-centric melody or more of a prog-rock style track where the mellotron is more featured? Im thinking of Secret Passage there, with its rich prog-like sonic tapestry. What can you say about that track as well? MIKE BROWN: Thanks. "Balloon" was actually recorded in 2010. It was one of the first tracks I recorded on a computer based system. Before then, I used stand-alone tape and digital recorders... At the time, I was working on the Everything Is Golden album, and "Balloon" just didn't fit. While I was working on the Skyscraper project, it popped up randomly on my iPod, and I realized it would make the perfect opener for the album. I find that the melody and mood generally dictate what instruments to use on a track. I really love a nice tuneful and tone-ful guitar, and that's the instrument I'm most proficient with by far, so I generally try to carry the melody with that as much as possible. Sometimes however, the tune calls for a different texture. I like having the choices that the mellotron offers, so I'll generally find a use for that if I can. I found this to be the case with "Secret Passage", where I used mellotron cello and piano to carry the melody. mwe3: Track four The Spring Of Our Content is very Shadows / Ventures oriented. Were you going for more of a retro style melody on that? Are those mellotron flutes on that track too? Theres a great musical resolution of that track. What Shadows era tracks or albums stand out for you? nice and moody, but uplifting. "Spring" features mellotron flutes, violin, and french horn, as well as a little harpsichord, tubular bells and some 12-string electric. My wife, Peggy, came up with the title by the way. She does that for a lot of my songs. She really nailed the mood. Sometimes I think she knows my music better than me! mwe3: What artists of today do you listen to today? In your estimation what guitarists and bands are breaking new ground for guitar instrumental or progressive instrumental / soundtrack albums in 2014? beautiful melodies and arrangements, and some of the coolest guitar tones I've ever heard. I found it very inspiring. I can't wait to hear what they come up with next. My friends, The Crazy Aces out of Nashville, and King Pelican from San Antonio both have instro releases slated for 2014 that I'm really looking forward to. In the soundtrack department, I think Daniel Luppi and Adrian Younge are both keeping that classic '60s/'70s spirit alive in their music... I just recently discovered those guys, it's great to know I'm not alone! My favorite recent release was not actually an instrumental album though. I think Steven Wilson's The Raven and That Refused To Sing is a melodic prog masterpiece. Very cinematic, very moving, and just downright Beautiful. Lots of mellotron too! mwe3: Friend is another great song with a definite 1960s kind of nostalgic vibe. I hear a Zombies like melody there! Or is that a Pink Floyd influence? Is that a fair assessment of that song? The 1960s play a big part in your music I assume! What kind of keyboards are you using on that track? Just amazing sounding. MIKE BROWN: Well, I'm a huge fan of The Zombies and Pink Floyd. On Friend, I was going for the mood of those classic early 1970's pastoral soundtrack themes... the stuff that played as the actors explored the forest "where the trees have leaves of prisms, and break the light in colors". Of course these soundtracks were influenced by the bands of the day, so it's all circular. The main keyboard tone in there is Hammond B3, one of my other favorite instruments. mwe3: How about Veni, Vidi, Vici? I love the title! Sounds a little Latin but with a dose of Classical Gas inspired sounds. MIKE BROWN: That's my full-blown Spaghetti epic for this album. It had to be done, and I had to do it! It started out with a couple of really simple guitar riffs, and before I knew it, I had completed what is probably one of my biggest productions to date. I love it when the orchestration falls into place. I never really know where a track is going until I start recording, and I'm always surprised by happy accidents that present themselves in the process... It's like the tune is writing itself sometimes! I had a lot of fun with this one, but it did take a lot of work. Peggy came up with the title here too by the way. Perfect! mwe3: The title track Skyscraper is very interesting. It gets back to the prog-rock instrumental sound again. This track sounds kind of Moody Blues inspired. Were you setting out to create a prog-rock masterpiece on the title track? Who are your big prog-rock influences? Also how about your favorite movies and movie soundtracks, being that your music is so cinematic! MIKE BROWN: I didn't have a set plan for this one really. I had just bought a new keyboard, and came up with the main riff while fiddling around, and went from there. I had some new Moog software, so I made use of some of my favorite classic synth textures during the middle break. Other than the guitar lead over the middle part, it's a very key-driven song. At one point, I thought it was too heavy on the keys, and considered leaving it off the album, but Peggy said I should keep it on there. I guess she was right! My biggest prog influences would be the melodic stuff - Moody Blues, King Crimson, Genesis, Supertramp, Focus, Camel, YES, Pink Floyd, Mike Oldfield, Earth and Fire... classic stuff from the late 1960s/early '70s. My favorite soundtrack composers include Ennio Morricone, Luis Bacalov, Riz Ortolani, Fabio Frizzi, Harold Budd, Goblin, Isaac Hayes, John Barry, Lalo Schifrin, Bruce Langhorne... I guess my all-time favorite soundtrack would have to be Morricone's Once Upon A Time In The West. It's so sadly majestic... I love it. Bruce Langhorne's score for The Hired Hand would be a close second. mwe3: The Fugitive is a great way to close the Skyscraper CD. Was the track inspired by the TV show The Fugitive or something else? mwe3: What are your plans for 2014 and beyond? What is the musical mission for The Man From RavCon moving forward? MIKE BROWN: Well, we just released The Ravelers final album, Ravel On. We actually finished recording it back in 2004, but broke up before we got it out. I'm pretty excited to finally have that one available for folks to hear. I may be biased, but I think it's great stuff, and hope it doesn't go totally ignored. I'll probably work with Peggy on a couple more videos for tracks from Skyscraper. She's a great photographer, and has a really good eye for matching visuals with my music. Being a one-man operation, it's great to have someone else to help me out every once in awhile! I may get around to finishing up that Blaxploitation project, unless something more interesting presents itself... who knows? I guess my mission would be to just keep making music that interests me, so that folks that like the sort of things that I like, will have more to potentially discover. That's about all I can hope for.